Buddleja are an asset to any garden. They are the first proven breeding line, with plants growing dwarf and easily kept to under one metre in height with little pruning needed. Buddleja BUZZ™ attract butterflies, small birds and insects creating a forever changing scene in the garden. The Buddleja family is well known to most gardeners and are easy to grow in sunny to semi-shaded positions. Flowers are almost constant year round in most climates giving a splash of colour and good perfume. Buddleja BUZZ™ grow well in large garden pots and in garden beds. 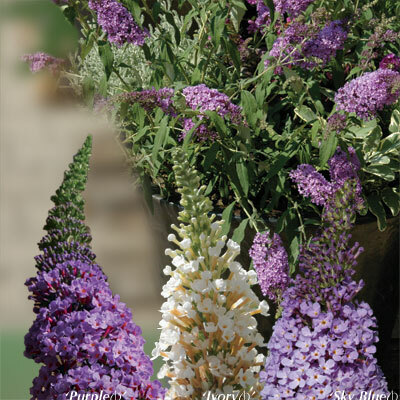 Buddleja BUZZ™ are well behaved plants growing only to a metre in height. If planting in a large pot, use a good quality potting mixture. Garden soils should be well prepared with cultivation of the area and adding garden compost to the mix. Most soil types are suitable; an application of a complete fertiliser to the garden bed in spring after the main pruning promotes vigorous growth. In winter temperatures to 5°C are tolerated but heavy frosts will cut them back. During the year trim back the older growth when flowers are showing signs of slowing off and getting smaller. The use of a slow release fertiliser is recommended for pot grown specimens.